Dog trainers are often asked how owners can find time in their busy days to train their dog. The second question that comes up is how often and how long to train their dog. That was addressed in an earlier article, “Auto train your dog.” The purpose of this article will be to discuss the first question. 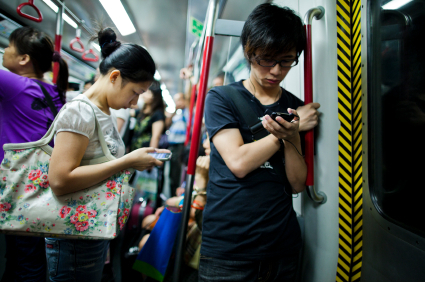 But first, while riding the subway in Singapore recently, I was amazed by the number of people accessing their smart phones, iPads and other tablets to pass the commute time away. All were engrossed by their portable devices, whether it was to read/respond to email, interact with Facebook, watch movies or play various games such as Solitaire. Many of them were switching back and forth on their devices amongst programs and carrying on conversations with companions. And, it’s a similar sight in other large cities, as I have noticed the same behavior on the New York subway as well as the “People Mover” mono-rail in Detroit, Michigan. They are multitasking to not only accomplish tasks but also as a pleasurable way to pass the time during the routine commute. There are many business articles about the pros and cons of multitasking in today’s world as well as suggestions how to multitask more efficiently. Multitasking isn’t just for the business traveler. It can also work in the dog world. The original question presents the belief that there is a limited amount of time in a day to train the family pet. I say “belief” because we all make decisions about what gets our attention throughout the day. Despite this, there are real-time struggles of working at one or more jobs, raising a family, taking care of extended family members, and managing other commitments. Thus, the time element is a real problem that needs to be better managed. One has the option of either eliminating one or more commitments to fit in some daily dog training or one can use multitasking to train the family dog. With practice, you will soon be able to train your dog through multitasking as easily as the subway commuters are able to multitask with ease. What other ways have you come up with to train your dog via multitasking? If you need help teaching your dog basic dog obedience commands so you can begin multitasking and auto training your dog, contact the Michigan Dog Trainer. This entry was posted in Dog Training Tips, Uncategorized and tagged Auto Train, Detroit, dog, dog obedience, dog training, family pet dog, Michigan, Michigan Dog Trainer, Michigan Dog Training, Pet, pet dog. Bookmark the permalink.